Longer Range: Transmit visually lossless video up to 500ft with no delay. 2 New DFS Channels: Operate interference-free more often in the USA and Europe by making use of two newly introduced DFS channels. Individual Identity: Easily identify which Bolt TX and RX work together with removable colored top plates. Built-In HDMI to SDI Converter: Perfect for use with MoVI and other gimbals, Bolt’s TX has a built-in HDMI to SDI converter, allowing you to connect both your on-camera monitor and video source via the same device. 20% Smaller Chassis: Not just smaller, but lighter too, allowing these models to integrate into any rig unnoticed. Rapid Reconnection: Reconnect times during a dropped link are now instantaneous once you move back into range. More Robust Than Ever Before: Reach your Bolt’s full range and potential right out of the box with new software that provides the most robust wireless link we’ve ever created. Support for Spectrum Analyzer: You can now view which channels are not ideal for Bolt whenever you arrive on set. No more guessing, no more mystery interference. 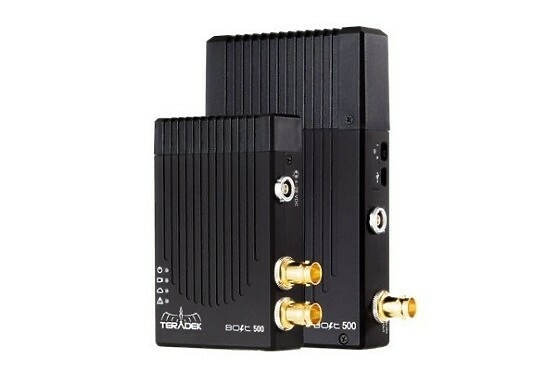 Hire the Teradek Bolt Pro 500 TX / RX from Procam. Best service and rental rates for the Teradek Bolt Pro 500 TX / RX and all cameras, lenses, sound, lighting and grip.